Hunting season is right around the corner, so it is time to start preparing your all-terrain vehicle for that bear, deer or other hunting trip this fall. 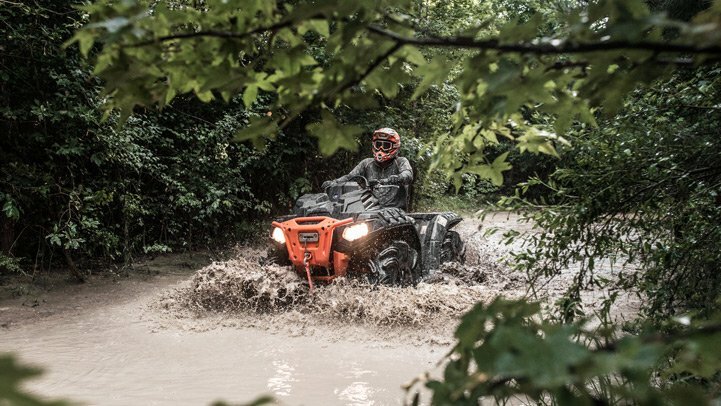 Of course a regular maintenance check should be part of your pre-season preparation, but getting the most out of your ATV also means equipping it with the right accessories to make your hunting trip a more enjoyable experience. The ATV is an invaluable tool for traveling to remote hunting locations, but a wide spectrum of accessories, available from a variety of manufacturers, promise to make your ATV the ultimate hunting companion. A hunter can spend anywhere from a few dollars to thousands of dollars on ATV accessories, but the best way to select extras for your ATV is to assess your hunting needs. Some accessories are almost mandatory, while others are expensive luxuries. Among the basic necessities is a camouflage kit. Most ATV manufacturers provide model-specific kits, but universal kits are also available. The ideal kit is scratch, fade, and water-resistant, no gloss, and easy to apply. Another must is some sort of cargo bag. Whether it is a front or rear mount variety, factors to consider include weather/water-proofing, tear resistance, camouflage coloring, size, and number of compartments or pockets. A cargo bag also should mount easily to the ATV and hold firmly in place when driving over rough terrain. Among the most important investments a hunter can make when purchasing ATV accessories is a quality gun or bow rack. An inexpensive or low-quality rack offers little in the way of protection for your bow or gun. For gun owners, the best choice is a gun boot, which mounts to the ATV. A quality gun boot is water tight and lined with padding to keep guns dry and protected. The boot should disconnect from its bracket for storage or transport. Another option is a rack that mounts to the front or rear of the ATV. Gun, bow, and combination gun/bow racks are available from a variety of manufacturers, but the best racks hold a gun or bow solidly in place. A quality rack can be fitted with a nylon cover that protects the gun or bow from weather, brush, and other potential sources of damage. Another useful accessory is a deer- or bear-stand carrier. A quality model is easy to install, lightweight, and holds the stand firmly in place, even when driving over the most rugged of terrain. For hunters longing to turn their ATVs into the ultimate hunting companion, a variety of expensive, but useful accessories are available. A number of companies offer deer totes, which are designed to remove big game from remote locations. Deer totes resemble a stretcher and are pulled behind the ATV. Deer totes offer easy transport of big game. Of course there are many other accessories for ATVs that fall somewhere between the mandatory and the luxurious. Other accessories that are nice to have, but are not essential include a winch kit, brush guard, headlight guard, windshield, handlebar mitts, ATV cover, and tow-behind cart. Whatever accessories you choose to purchase, make sure they are proven and carry a reputation for quality. You do not have to buy the most expensive brands on the market, but do not buy the cheapest. Nothing can ruin a hunting trip faster than damaged equipment or equipment that does not perform properly.